Prayers for your Goals, Dreams, Success, and Purpose! The most encouraging and inspirational Prayers! Positive Prayers will help you Pray God's Word and Believe God's Promises for your life! They will fill you with hope and encouragement. They help add Biblical Prayers to your daily prayers. All Prayers are backed by a Bible Verse for further study. God, I pray to always have goals and dreams according to what You have called me to do. Thank You that when I call unto You, You answer me, and show me great and mighty things, which I know not. Thank You Lord – that You are able to do exceeding abundantly above all that we ask or think, according to Your power that works in us. With You God, my talents are being multiplied. I am blessed. I have unlimited potential. God, I believe Your Word – eye has not seen, nor ear heard, neither has it entered into my heart, the things which You have prepared for me. Thank You Lord for giving me vision and purpose. I have faith that I can do anything that You have called me to do. I praise You Lord! You are our all-knowing and unlimited God! You can see the end from the beginning. I pray for wisdom and direction in every area of my life. Jesus, You are greater than any obstacle we face. Greater is He that is in me, than he that is in the world! I give thanks unto You LORD; for You are good; for Your mercy endures forever. Thank You Lord – that as a child of the living God – we are made to be winners. We were born to succeed! We are made to be the head and not the tail; above only, and not beneath. With You – we can have victory in every area of our life. With You God, all things are possible! Thank You for helping me to succeed! 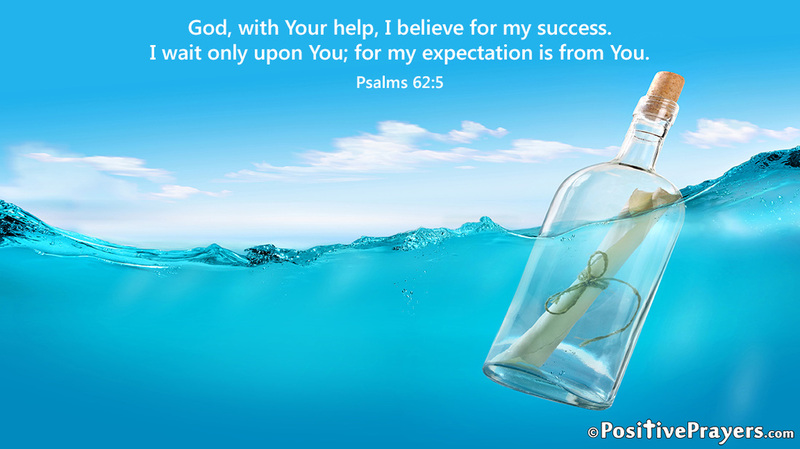 Enjoy the 52 Best Biblical Prayers for Your Success! Positive Prayers will help you Pray God's Word, and believe God's Promises! They are the most Encouraging and Inspirational Prayers. They will help you to stay thankful, and appreciate all of your blessings. Positive Prayers will help you live the abundant and blessed life! With God all things are possible! Praying God's Promises will fill you with FAITH and BELIEF. Jesus said, "All things are possible to those who believe." Listening to Positive Prayers daily will help you to add Biblical Prayers to your daily prayers. Learn to speak and pray God's Word! If you change your prayers, you can change your life! Click for the full 52 Positive Prayers for Your Success eBook.